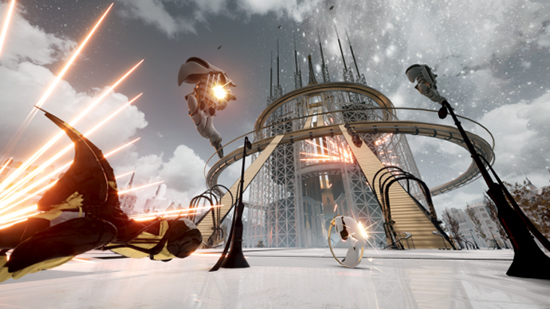 Singularity 5 moves the ‘VR’ experience up a big notch with this epic and ambitious 5 level arcade focused shooter, set in Paris in 2050! Developed by Monochrome, a French indie developer, this self funded and in house inspired title offers skilfully crafted settings with an impressive audio mastery that enhances the whole dynamics of the game. It's stunning vistas, complement the linear story, that opens up a world of a dystopian society. With Easy, Medium and Hard modes selectable, Singularity 5 is accessible and caters to all play styles. On the Level The player will explore five unique levels in Paris, each with its own unique pictorial setting to provide a striking look that will immerse the player deeper into the challenge. Level 1 introduces the player to the action inside the Palais du Trocadéro, transformed in recent decades into an Haute Couture fashion factory. You are a soldier on a mobile platform with other platforms around with prototypes on which Dressmakers & Drones are working. During a routine tour you find that one Artificial shows suspicious and violent behaviour who then suddenly began attacking humans. You will have to face and destroy these robots using a vertical travelling shot. Level 2, The Bridge, sees you confronted by hordes of robots in a eye catching setting. Complete this challenge and a Futuristic Moto will be presented to glide onto Level 3, which takes you to the iconic Eiffel Tower and there stands the gigantic Arachnoïd, along with waves of ‘artificials’ on the attack. Level 4, set in a majestic setting of French gardens, is where you will find the Boss Arachnoid, along with its supporting army before heading into Level 5, the final challenge, to save Paris with a darker and more sinister setting. "We believe that Virtual Reality is a new medium at the crossroads of experience, video games, art and knowledge." Monochrome.